There is a fake leopard screen shot contest here . There are alot of prizes (read the first post) and all of you mockup gurus out there should enter. Class in a tall pint glass!! I'll post the finished stills soon. Just to clarify... Do you mean the space surrounding the tab in Safari? What's your reason for the icon changes, each one? To be honest, there aren't any 'real' reasons behind the changes. The simple but not so simple thing I have been trying to achieve is creating a unified interface. The colour blue in the System Prefs and Dashboard icons are supposed to show that they are active (altho System Prefs isn't looking too open at the moment). Address Book and iCal merged is something that has been discussed/designed before but I like the idea of them becoming one application titled 'Planner' or something like that. 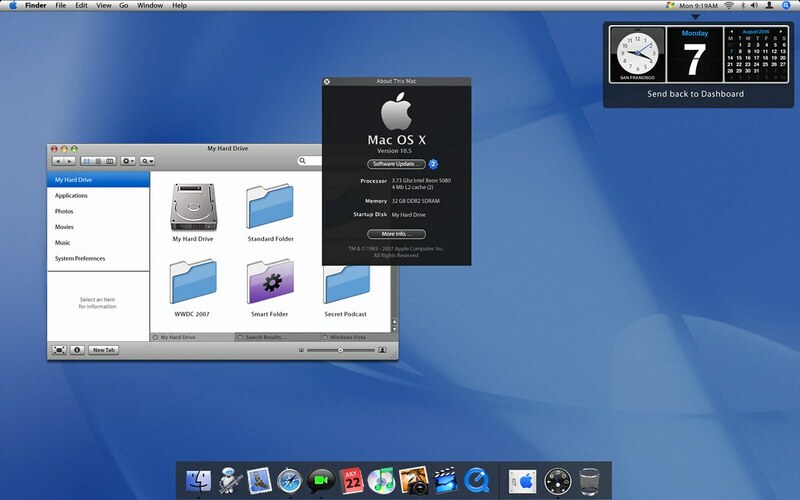 The menu bar color change, the blue apple in prefs icon and the black iChat icon are unnecessary IMO, Apple wouldn't do that. This "Planner" icon is a bit nicer, it is canvas. Yeah, the strange thing is... I agree with you. But I was simply sticking to a system whereby I was trying to tie certain elements of the UI together. The top bar does change with each release (i do believe) and I tried to keep the metal theme running throughout. 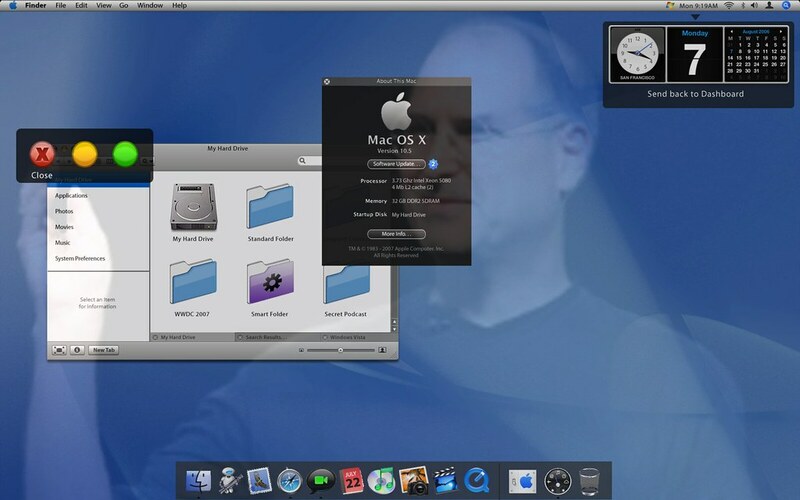 The blue apple in the system prefs was just a simple idea to make the icons in the dock a little more animated. It glows blue as you open it (I did this mainly because of the glow patents for the Mac hardware/cases). The iChat icon was changed simply because I wanted to signal that the application had changed (due to the collaboration and VoIP rumors. Although in hind sight a symbol adjustment rather than a color adjustment would have been better suited. There is a fake leopard screen shot contest here . Just a couple of weeks before the Leopard preview in WWDC, and still no idea of what is coming. Only fakes, and even an "official" fake screenshot contest. But.... it does give you a chance of winning $1,000 worth of pretty decent software, which aint all that sad. I'm really pleased there aren't any solid leaks on Leopard. I like surprises. Let's hope they pull this (pun removed) one outta the bag. 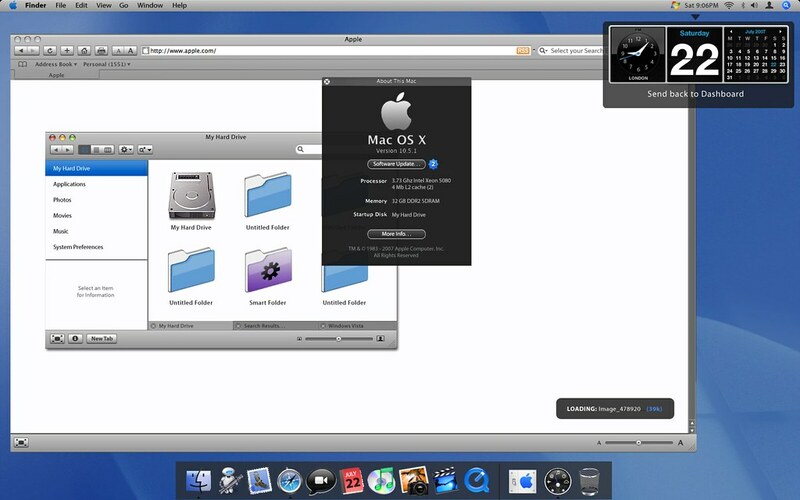 Not to diminish your post but lately, the mockups I have seen of the new finder are pretty uninspired. I don't even find tabs in the finder a desirable feature. 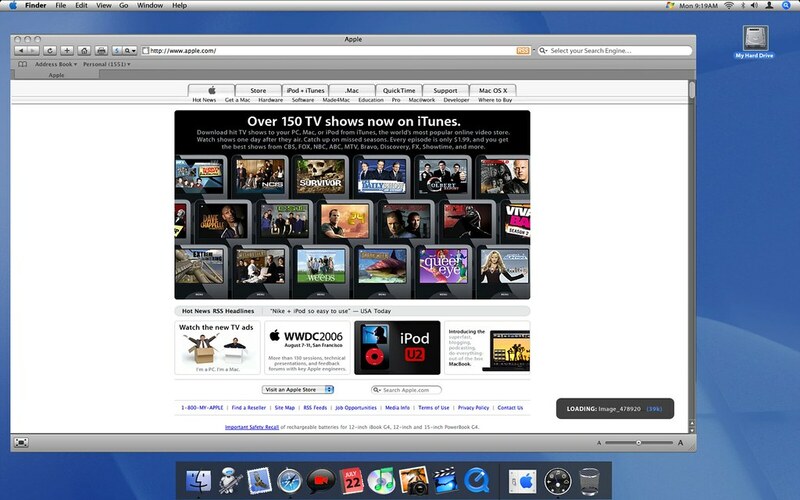 I saw a very impressive one a while back that used a lot of interface elements from iTunes. It looked great. Unfortunately I can no longer find it. The reason I posted at all is because I was hoping someone else had seen the same mockup that I was referring to and would post it here. Also, if you read the post carefully, it should be clear that I was referring to the recent mockups and not just the particular one in this thread. I apologize if it seems otherwise. I just think we should be dreaming higher. If a redesigned finder means tabs and a icon scaler I will be truly dissapointed. edit: I finally took a look at the thread with submissions for the contest. There are some good ideas there. final edit: Now that I have read the entire thread I am pretty sure the mockup for the finder I was referring to was made by Shidoshi which has entered some particularly fine mockups into this contest. Shidoshi did some great work. I'm not sure how 'Apple' his work is, but it's still good. I think Shidoshi's finder is what it would look like if they made it for pros as they have done with Aperture but since it has to be usable by everyone it probably won't be anything like his idea and it will be dumbed down. The video thumbnails idea is awesome but I am sure quite resource intensive. I hope the new finder has more aspects of itunes built into it. Auto-resizing columns, alternating row highlighting, directly editable metadata, etc. I guess even tabs could be useful but it's not at the top of my list. I am coming from the Windows world and I have to admit I find organising with the finder to be difficult in comparison to Explorer. I would also like to see better use of dialogs when copying or moving files around. More information, better multitasking, and better handling of file conflicts. One thing I really hope Apple decides to do is to move away from storing metadata in a central database as is done in iPhoto and accross the board decides to store metadata in the original files (as is done in iTunes). MS is doing this with Vista and I think it's the right way to do it. Care to explain the XP/Vista icon in the menu bar? 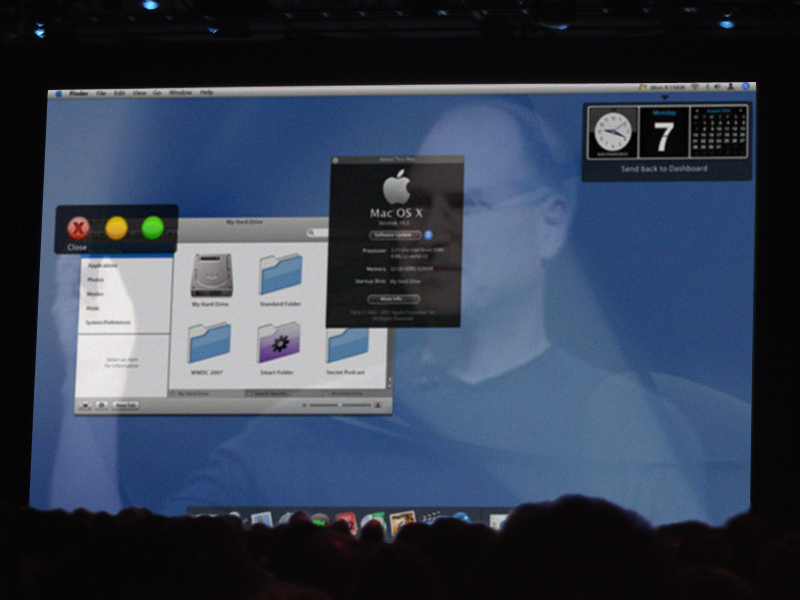 Are you speculating that Apple will add some form of Windows emulation? Not sure where he was going with it, but I have the same icon - it is RDC Menu. I really like what you did on the bottom of the window. The slider and buttons add a nice touch.